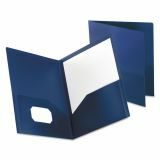 Stylish cut interior pockets with die-cut to keep business card in view. Durable poly material resists moisture and tearing. Oxford Poly Twin-Pocket Folder, Holds 100 Sheets, Opaque Dark Blue - Poly twin-pocket folder is wear-resistant, tear-resistant and moisture-resistant to protect your documents. 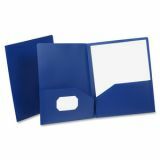 Each folder offers pockets on the inside front and back covers, and a die-cut, business card holder on the left inside pocket. Each pocket holds 50 sheets for a total capacity of 100 sheets.